When the folks at Two Horse Tack approached me about reviewing one of their products, I was intrigued. They make bridles, halters, reins, breast collars, and other tack out of Beta BioThane, a web-coated nylon material. 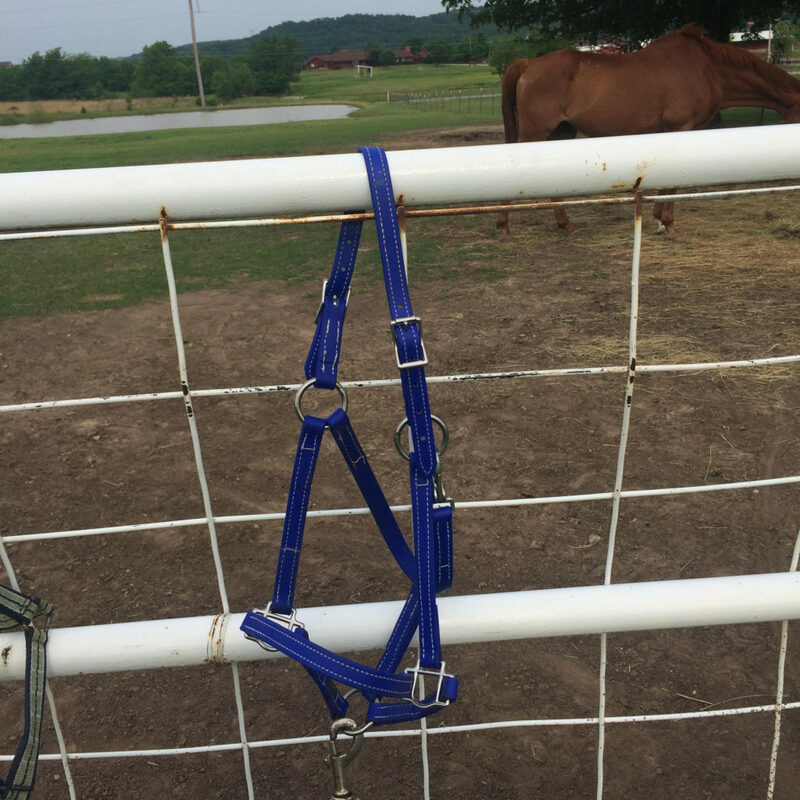 Since Candy needed a new halter, I opted to review their turnout halter. Candy broke the leather halter she came with a few months ago and had been wearing Moe’s cob-sized leather halter ever since. I’m not a big fan of leather halters even though they look nice- I find they get stiff and can be difficult to buckle. Two Horse Tack offers the turnout halter in a plethora of sizes and colors. While Candy is solid-bodied 16 hands, she has a very refined head. I chose horse size for her; Two Horse Tack describes it as fitting “most horses 14.2-16 hands”. I also chose the 3/4″ width, as I thought it would suit her delicate face, and the dark blue color because it looked more like royal blue online. Candy modeling her new halter. The halter arrived quickly and I was immediately impressed with the look and feel of the Beta BioThane. It’s extremely supple and smooth, but lacks that plastic feeling I typically associate with synthetic leather. The color was vibrant and bold, and exactly the shade of royal blue I expected. It fit Candy well- the double buckle crownpiece makes it very adjustable. The halter is right on the middle hole on both sides of the crownpiece. The noseband sits a little high, but it doesn’t seem to bother Candy. The throatlatch snap makes the halter easy to get on and off, but it’s equally easy to unbuckle the crownpiece because the Beta BioThane is so pliable. It even looks good hanging on the fence! I’ve been using the halter on Candy for about a month, and it couldn’t be better. It hangs outside on the fence all day while she’s turned out in the front pasture and the color is just as bright as it was straight out of the box. The material is still flexible, too. I’ve rinsed the halter off a couple of times after dropping it in the mud- the grime comes right off and the halter looks great. Friends at the barn regularly compliment me on how pretty the halter is! There are lots of things to like about the halter: it (and the Beta BioThane) are made the USA, it’s available in many, many sizes and colors, it’s easy to care for, and it’s attractive. Priced at $30, it’s an affordable piece of equipment that’s an excellent value! 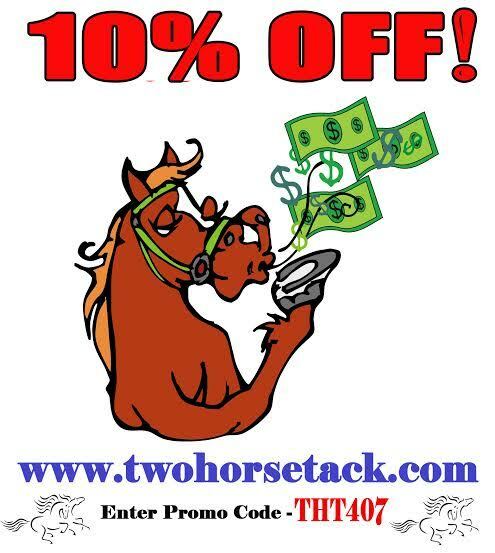 You can sign up for Two Horse Tack’s newsletter to stay current on their latest products and promotions. You can also save 10% on your order with promo code THT407! How do you feel about synthetic leather? What kind of halter do you use? Seems like Two Horse Tack hit up all of us, haha. That blue looks super sharp on Candy! And I like the narrower straps on her her more refined face. I really love my halter too, need to get three more so all my hooligans can have one! It’s definitely a great looking halter- I’m going to order one for Moe! Gina’s stuck with the naughty horse rope halter for the rest of her life tho, haha. Does it have a breakaway? Or is it like real leather that will in fact break if need be? It will not break, but you can order it with a breakaway leather crownpiece. This isn’t an issue for me since my horses are turned out halter-less, but Two Horse Tack does have an option for a breakaway leather crownpiece! 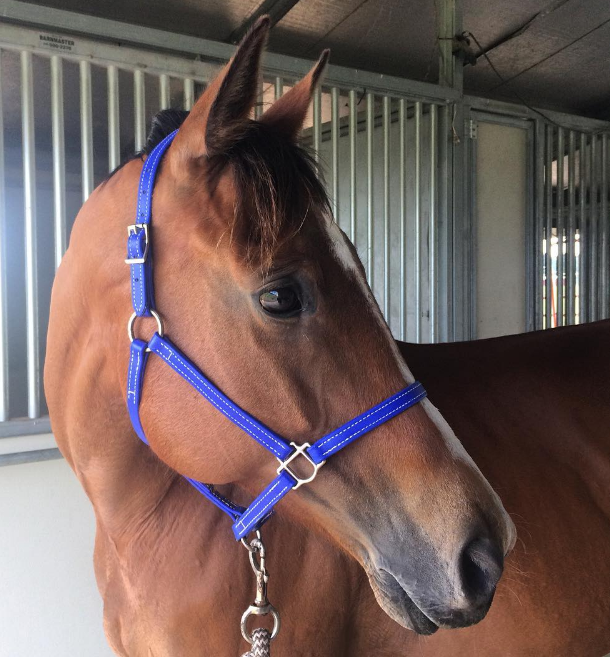 For those who need a breakaway: I made Harley’s twohorse halter into a breakaway- I snipped the short strap under the buckle and replaced it with a leather breakaway piece. It was easy and I think it looks better than the full crown-piece option they offer. I love synthetic leather products, very easy to clean and take care of. I’m not into cleaning tack, so pretty much the best option for me! I love it! Charlie has the same one but with added bright blue two tone padding on it. He’s been using it for quite a while now and it shows no signs of wear. Can’t beat that! I’ve never heard of these! They look like they’d hold up well, and stay more clean than my regular nylon halters. Thanks for sharing! I think the color is perfect for her! Random – but is she your horse now? Did that happen a million years ago and I missed it?